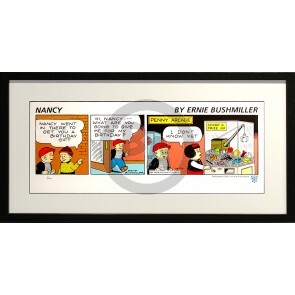 Ernest Paul Bushmiller, Jr. (23 August 1905 – 15 August 1982) was an American cartoonist, best known for creating the long-running daily comic strip Nancy. Bushmiller quit school at 14 to work as a copy boy at the New York World newspaper, while attending evening art classes at the National Academy of Design. He ran errands for the staff cartoonists and was given occasional illustration assignments, including a Sunday feature by Harry Houdini. Bushmiller's ubiquitous art style employed simplicity to the point of formulaic design, making it instantly recognizable even when reduced further in detail. 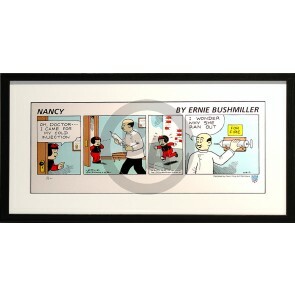 As comics scholar Scott McCloud observed, "Ernie Bushmiller's comic strip Nancy is a landmark achievement: A comic so simply drawn it can be reduced to the size of a postage stamp and still be legible; an approach so formulaic as to become the very definition of the "gag-strip"; a sense of humor so obscure, so mute, so without malice as to allow faithful readers to march through whole decades of art and story without ever once cracking a smile. Nancy is Plato's playground. Ernie Bushmiller didn't draw A tree, A house, A car. Oh, no. Ernie Bushmiller drew the tree, the house, the car." In 1979, Bushmiller was diagnosed with Parkinson's disease, but he continued to produce the strip with the help of assistants Will Johnson and Al Plastino. He lived in Stamford, Connecticut, where he died in 1982.